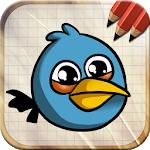 We invite you to draw Angry Birds games characters using our drawing app! 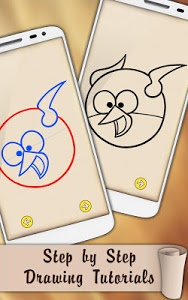 The application works in such a way that getting a lesson on drawing - you get about 10 steps, that help you to finish your drawing. Improve your skills in easy and qualitative painting with the new angry birds transformers! Draw by yourself and offer to learn to draw and to your friends also! In our drawing app you get incredibly useful skills that will be useful also in your everyday life, because to be able to draw - it's amazing. 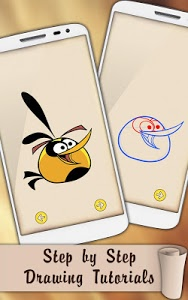 The application is arranged in such a way that once downloading it you get round the access to a huge bank of pictures of your favorite cartoons with detailed step by step instructions for drawing. You can use the app even when you are offline and it is incredibly easy! 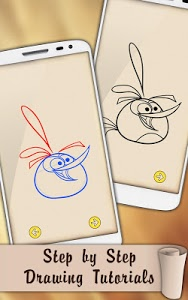 How to draw Angry Birds is very clear, and they can follow even a child! 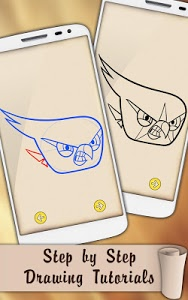 Draw angry birds 2 and save the image on their mobile devices! Images can be sent to your friends on e-mail or put on a social network. And then everyone will appreciate your artistic talent. 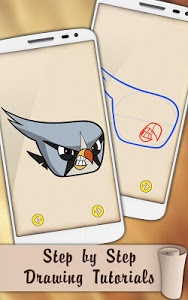 Drawing Lessons Angry Birds is not associated, affiliated, endorsed, sponsored or approved by Rovio (Angry Birds developers). All Angry Birds images and content from wikia.com taken under Creative Commons Attribution-Share Alike License 3.0 (unported) (CC-BY-SA). 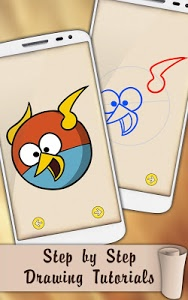 Similar to "Easy Draw Very Angry Birds"